Let's talk about the dad figures on Stranger Things, shall we? Ted Wheeler: useless and absorbed in his newspaper; the Byers' dad from Season 1: not too charming; Billy and Max's father: also way less than ideal; many other characters' fathers: absent. And don't get us started on Papa. And then, like a breath of fresh air, here comes Hopper! His paternal energy (along with Steve, who emerges as an unexpected protector in a character turn that shocked us all, but that's a different story) basically holds the show afloat, and though he doesn't do it perfectly, he steps up to father Eleven when the world has turned its back on her. He's supportive of Joyce, he's brave and selfless, and he has a tender story about his own loss that humanizes him and his mistakes. Yep, Chief Hopper is arguably the best character on the show, but inarguably the best dad in Hawkins, hands down! This licensed look comes straight to your from the Hawkins Police Department, and will make you instantly recognizable as everyone's favorite father figure. It's a tan shirt and matching pants, as well as a dark brown belt. 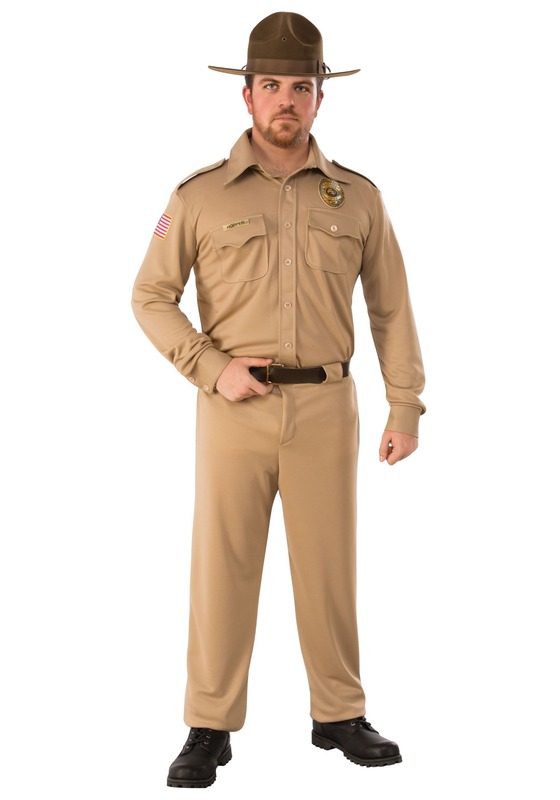 It comes with the sheriff's hat, and official badges, as well as the name "Hopper" emblazoned on the chest. Grab a toy rifle and team up with Joyce for a party, or go trick-or-treating with a friend dressed like Eleven. Or fly solo tonight, Hopper, and see if any of those Hawkins ladies are as taken with your charming personality as we are! Of course, we're still hoping that romance will blossom between Hopper and Joyce. But until then, continue your legacy of (mostly) mature parenting in this authentic costume. We'd be happy to have you on our side, no matter what kind of crazy creature we were up against!